This weekend I was invited to attend a group think at an Eco-Lodge in the New Forest on how we might ‘teach’ sustainability in the business schools. With duly packed sleeping bag and my contribution to the breaking of bread, I set off pondering what is a sustainable business … exactly? 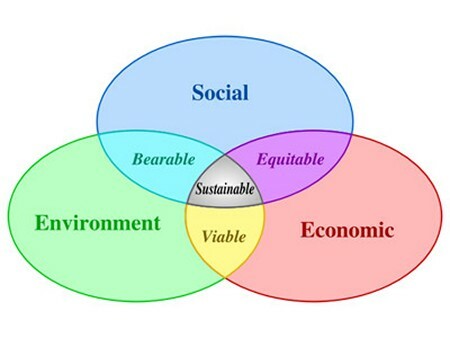 The Brundtland Report, published 25 years ago, described sustainability as a three-legged stool with people, planet and profit taking equal importance in the equation. Mark asked us to reconsider our common future in 2013 and how we might apply six essential characteristics to our businesses in relation to the local – economy, population and environment. It was really interesting to discover the majority of people discussed their personal impact on the environment … and yet there are two other aspects to making a business model sustainable. In particular, all of us has to make a living, we require food and shelter just to survive; to enjoy our lives we need to belong, feel good, then to be challenged and to be able to give back. The majority of us are in the service industry and therefore no longer work the land, or manufacture or produce. Therefore, I’d like to focus on the economic element. Whether we like it or not, the exchange mechanism for goods and services is financial. Assuming the Bank of England doesn’t print more money, the growth model can only work for 50% of the business population. There will be winners depending on how each satisfies a market desire and how well it communicates that; therefore there must also be losers. What goes up must go down elsewhere. You might want to consider this in terms of UK PLC and the rest of the world. If we do nothing different then the natural resources will have all but been consumed resulting in the death of the capitalist society. There are not the resources to maintain it. If we study the historical models used in the educational sector for business growth, we see that business, economies and societies grow the point where they will either fail entirely or shrink. The vision of a no growth economy however is beyond the practical comprehension of most. 1. Without growth there can be no interest on monies invested. The present economy runs on interest payments or collapses as we have seen recently. 2. Without growth monies lent to build would be without return and therefore without increasing the wealth of the lender. 3. Without growth how might we provide for old age if there is no returns on investments made? Can we start with embracing the Lean Start Up programmes (activities that micro businesses have been using for years) rather than stoically stick to sharing the successes of the big brand businesses that will at some point use up the resources? Can we start with endorsing work that companies like B-Corp are doing? Can we start with celebrating great examples of not for profit community projects and charities? Can we start with approving and following the Giving Pledge?